During Susan Ershler's 23-year corporate career, she held a series of executive positions in the sales divisions of Fortune 500 companies; led teams to sales records, growing sales from $1 million to $600 million; and ultimately as a Vice President. Along the way, she earned 11 annual President’s Club awards – for leading teams to top performance. During that era of corporate achievement, Sue and her husband, Phil, climbed the Seven Summits – the highest mountain on each of the world’s the seven continents. That remarkable journey culminated at the top of Mount Everest on May 16, 2002. 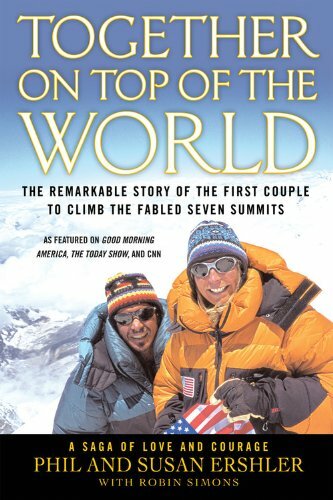 With that climb, they became the first couple in history to climb the Seven Summits. Gail Davis: Sue Ershler tours the world speaking about her live journey, and sharing with others her secrets for success, determination, and achieving seemingly impossible goals. Sue's record would be remarkable enough if it only [00:01:00] detailed her business achievements. She is, first of all, a businesswoman. For 23 years, she had a series of executive positions in Fortune 500 companies. She led teams to performance records, beating objectives from 1 million to 600 million, ending as a vice president. In her spare time, while she was breaking those performance records, she and her husband Phil became the first couple in history to climb the Seven Summits, the highest mountains on [00:01:30] each of the world's seven continents. That quest culminated with the two of them standing on the top of Mount Everest on May 16th, 2002, creating a worldwide media attention including "Good Morning America," CNN, "The Today Show," among many others. Sue is the author of two books. 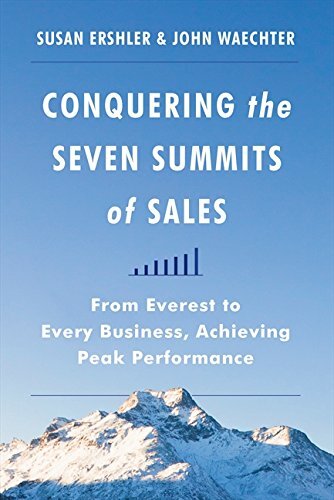 One is "Together on Top of the World," and the other one is "Conquering the Seven Summits of Sales." She shares her story, how she did it, and what it takes to climb mountains [00:02:00] and break performance records, and what her success of survival skills are for business and in life. Please welcome to today's episode of GDA Podcast, Sue Ershler. Kyle Davis: Hey Sue, how are you? Susan "Sue" Ershler: Good, thank you. Kyle Davis: Is it Sue or Susan? Because I see Susan all over the book, and we're saying Sue. Gail Davis: I'm sorry. I always refer to her as Sue. Susan "Sue" Ershler: Yeah, Sue is just fine. That's just fine. Gail Davis: I think it's because I've known you for a long time and I've met you. [00:02:30] Yeah, I have another speaker and I call her by her more familiar name, and then I have to remind myself not to do that. Good catch, Kyle. Thank you. Susan "Sue" Ershler: Yeah, and no worries. I go by both. Kyle Davis: I go by "Hey you," so there you go. Gail Davis: Golly. Here you have ... I know what it's like to have a corporate job, and 23 years as a star performer in sales, how did you find the time to train for the mountain climbing? I'm [00:03:00] currently training to go rim to rim on the Grand Canyon and I feel like I have a second full-time job. Susan "Sue" Ershler: Oh, yeah. Isn't that true? Yeah, my biggest challenge was ... Actually, there was a ten-year point of all this, which was a decade where we started climbing the Seven Summits, my husband and I did that together, but then I was climbing the corporate ladder at the same time. The biggest challenge is "How do you find the time?" [00:03:30] My career, that was ... Again, it was high-tech, but it seems like even in today's world in almost anything we have information overload, constantly changing environment, changing industry trends, new technologies, all of that. Then my personal life is like, "I want to be able to balance my work life but certainly with my personal life." I decided to travel light. That was the biggest thing, is just needed [00:04:00] to constantly focus on the vision. Get to the summit of Everest, that was the last Seven Summit, and then become a VP. That was the whole big goal. Then the big thing was stop doing some things. Travel light. Choose what not to do every single day. Eliminate all those time-wasters. Gail Davis: I had a friend once and she said, "Gail, you need a to-don't list." Susan "Sue" Ershler: Isn't that true? Gail Davis: That's [00:04:30] awesome. Kyle Davis: Yeah, I have a mentor, when I was working with him, and he used to have these things that we called TWs, which are time-wasters. It's just things that you just don't do. It's fascinating how many things, once you remove them, you realize that they were costing you money. Susan "Sue" Ershler: Yes, so true. Gail Davis: Now that you say this, I had one other athletic achievement in my life, which was running a half marathon. I did become super efficient at work, [00:05:00] now that I think about it. When you have that training schedule you know what you have to do and then maybe you're more efficient. Kyle Davis: [inaudible 00:05:08] that though. I mean, a lot of top performers I know are also top performers in some athletic event. Kyle Davis: It's some discipline, yeah. I'm going to name one person. His name's Chris Mockett. This guy holds every west coast marathon running record. For lunch he would go run 13 miles and be back within an hour. I just was like, "What? That's insane." Gail Davis: How did [00:05:30] you and Phil get into this idea of ... Were you climbers? Did you hike? Tell us the backstory on that. Susan "Sue" Ershler: Yes, and that was kind of interesting at the time because I was 36 years old. Never hiked or climbed any mountain. I didn't know Phil Ershler. What happened was, and here's the benefit of having clients. I had a client and I was really bonded with John. John told me one day, he goes, "I've done some climbing." [00:06:00] This was a CEO of a company here in Washington. He says, "I've done this climbing, and the international mountain guide is Phil Ershler. I'd like to introduce you two." I'm like, "Really? What do we have in common?" He did it at a holiday event one evening and was like, "Whoa." I just got addicted to Phil. I was in love with him. I just decided, "Okay, go this route." We started dating [00:06:30] and within six months he got me into mountaineering and he took me up Mount Rainier, which is our highest mountain here in Washington. Gail Davis: How high is that? Susan "Sue" Ershler: That started ... That's only 14,400 feet. Susan "Sue" Ershler: But it was hard. Kyle Davis: Only 14,000 feet. Gail Davis: We live in Texas and trying to find elevation here is just next to impossible, so I'm super impressed that you have a little small hill that's 14,000. That's awesome. Susan "Sue" Ershler: I'm with you, because when I was looking at it all [00:07:00] these years, again, until I was 36 I thought, "I'm not climbing that." It's a beautiful mountain, but ... Then when I got up, and it was so hard ... I probably shouldn't share this, but I puked. I got to this place at 12,000 and just ... I thought, "I'm going down." He's like, "Come on. Don't you feel better now?" I'm like, "Oh, yeah." We kept going and I'm so glad we did, because when I got to the summit it's like ... Oh, that was [00:07:30] the best day of my life. I'm like, "I'm addicted to this sport. I love it." I just wanted to then climb higher with him. Gail Davis: That's awesome. How many years did it take for you all to climb all seven? Susan "Sue" Ershler: Because of my work, it took a decade. It took ten years. Because the next ... It was about two months later, we did go down. I had not been out of the country, but we went down and climbed Kilimanjaro in Africa. We also climbed other mountains [00:08:00] throughout the different countries, but over the course of time we had climbed some of the Seven Summits. He'd already done it. He had climbed Everest in 1984 and he became the first American to climb the North Face. He was into it. He knew how to do it. He's one of the best guides on these climbs. Then we got to a point where we'd done six of the seven, and that's where the biggest challenge was. "Now let's do Everest." Kyle Davis: That's awesome. [00:08:30] Aside from Everest, did you do any other mountains in the ... Did you do K2 or anything like that? Susan "Sue" Ershler: He did K2. I didn't do K2. We did things like the volcanoes that are there in Mexico, in Ecuador. Went down to Ecuador a lot. Different climbs all over the place, but the Seven Summits was the highest mountain on each one of the continents. Kyle Davis: Transitioning from mountaineering to sales, what are [00:09:00] the seven peaks or seven mountains of selling? Seven Summits, my apologies. Susan "Sue" Ershler: There's actually several different ones, and it depends on also what you're going for. Basically, it's all the things that we do. What I would like to share with you too is the project, prepare, persevere, because whether we're going after the Seven Summits in sales or ... This is [00:09:30] what I needed to start out with, is those three words, is project, project the future ... For sales, I wanted to be a VP. That was my goal. For climbing, in the end I wanted to be ... I needed to see myself on the summit of Everest years before we even did it. Project. Then prepare. Pulled a real strong plan together. Just like you mentioned, that's something that we have to do with sales for sure, and business. Business, because plans change. [00:10:00] Plans change on Everest. If we have one and we're constantly going after it, that can really help us, especially when we're with a team. Lastly is to persevere. Working relentlessly to obtain it despite all those obstacles. Going back ... Have you ever been knocked down? Anybody ever told you no? Going back, going back. That was the big ... That's the hard part, I thought. Kyle Davis: Often I get grief for doing what's called future selling. I talk about [00:10:30] how great something will be in the future and how it's coming along, because that's how my mind just automatically works. I know that for me it's what I need to be able to have some end goal or drive coming forward, so if I'm going to climb a mountain I'm going to be thinking how great it's going to be when I'm on top. I'm wondering, for you, when you're setting down this game plan and this vision to say, "Hey, I'm going to be VP or I'm going to go from a million to 600 million," are you trying to not just get buy-in for yourself but are you trying to get [00:11:00] buy-in for your team and the people around you? Are you selling to everybody? Are you projecting to everybody? How does that work for you? Susan "Sue" Ershler: Yeah. In the sales world ... I was actually in the service side for quite a while. I was a leader there. We were fixing everything. Then I got put into sales by a great mentor of mine, Walt. I'm like, "Oh, I love this. I'm down in Seattle." [00:11:30] It's like, "Okay, you got a million-dollar objective the first year." I'm like, "Oh, I love this." I'd go in and I'd work with clients, but I didn't hit 100%. Almost that first year, I lost my job. I'm thinking, "All right. I'm changing. I'm going somewhere else." Then Walt just ... He really ... I will never, ever forget this, because he said, "Focus. Become an expert in one area." What I needed to do constantly, one of the biggest things was ... [00:12:00] I went back home and decided, "Okay, yes, you're a workaholic. You can work harder, but work smarter. Constantly focus on educating yourself so we can educate others, whether it's clients, our team members, whatever." Had to do that constantly every year. That really helped, because the next year hit well over 100% and decided, "Okay, that's what we're going to do from now on." I'm not sure if I answered that question [00:12:30] completely. Kyle Davis: I think you did. When it comes to constantly improving and constantly educating yourself and doing this pivot to what will be, if you rest on your laurels and you're not growing, then you're dying. That's my thought process on that. Susan "Sue" Ershler: Yes, I agree. I agree. It's almost ... Every year we needed to do this. One year I got [00:13:00] regional sales manager of the year, and my whole team won awards. It's like, "Hey, we're good. Back off a little. You don't have to work so hard now." Well, we got complacent, and didn't hit the objective that next year, so decided, "Go back to this. Just constantly educate." Then there's so many other things too, like guiding our clients to success. If we can guide them to success, we will be successful and happy just like they are. [00:13:30] That's the real big one, is again to educate them, but to guide them to success. Kyle Davis: On the preparedness front, when you're starting to repair ... I know you said you're in high-tech software sales, so I'm assuming, since my background is in that, you had these extremely long sales cycles with multiple parties involved and everything else. When you're going through it and you're preparing this out, and the same as you would prepare a climb of Kili or something like that, [00:14:00] are you looking at all of your strengths, or are you looking in the blind spots? Are you trying to take in a little bit of everything? How are you preparing for that? Susan "Sue" Ershler: Yeah, and the big part was, too, because within that prepare there were four of those seven summits, which is plan the route, guide your clients to success, build your Sherpa team, and then execute the route. The big one is plan the route. What we really needed to do [00:14:30] was step away from the business the first year, at the beginning of the year, and where are we going to go now? What do we really need to do to go much, much higher? Then pull this real strong plan together. The clients, how we're going to guide them to success, what we're going to do, all those details. Then when we're back in the office, everything's spinning out of control, I just needed to keep coming back to that plan. Follow those [00:15:00] activities and stop doing, just like we mentioned earlier, some of the rest of that stuff. Kyle Davis: Could you talk for a moment about the importance of actually stepping away from your business? I think too often people get ... They feel like going to these sales kickoff meetings and taking this week off is just ... "It's not that important and I'm not going to hit my quota for the month." There's so much that can be gleaned from taking time and really planning out your route, whether it's sales or climbing. That's so important during [00:15:30] that time. Susan "Sue" Ershler: Yeah, and you're absolutely right, because if we just did everything every day, is it the right thing that we need to be doing? Again, we just needed to step away and take at least a few days where all we're doing is looking at the next big vision and everything that's going to make that successful because then, when we're in the office, we keep looking back at it. The other thing I truly needed to do too, [00:16:00] because every morning before I did anything, I needed to look at our vision. That's what we're going to do. Every single activity today with my team, it's going to be focused on that, and if it isn't, again, we'll get rid of it. Kyle Davis: Yeah, I talked to another mountaineer and I heard the same sentiment from some friends of mine that were in the military or some adventure athletes, and they all say the same thing. Complacency and just going through the motions will get you killed. Kyle Davis: You really have to plan for every eventuality, [00:16:30] because it's like Moore's law or whatever. If it happens, it'll ... That's not Moore's law. If it's bound to go wrong, it's going to go wrong. That's not Moore's law. I think Moore's law is computing. It doesn't really matter. Gail Davis: Sue, at what point did you get into speaking? Susan "Sue" Ershler: That was right when we were finished with the Seven Summits. I had a lot of requests, [00:17:00] and I had been, again, in the corporate world for 23 years. Loved my job, but I was asked to do this, and I thought, "Well, I'd like to do something for another decade or two." Got into it, and I did decide too at that point that the most important thing was, "You have gone after your dreams for so many years. Help others reach theirs." That was really my goal in doing it, and what [00:17:30] I've really loved about it. There's one other thing, too, that I'd like to share with you. One of the big things, too, is 11 years ago I wanted to help the girls stay in school in Nepal. I started working with American Himalayan Foundation. Again, when we talk about speaking, this is every time I do it then I donate a certain amount to the American Himalayan Foundation, and that stops girl trafficking. From the time girls are [00:18:00] six to seven years old ... At the time, 11 years ago, there was only one in five women or girls in Nepal that could read or write. Very heavily trafficked and very poor families a lot of times. Decided, "Yes, I want to do this," and so from six to seven, eight years old through high school, right now, at this point, right now, at this moment, 14,000 girls are staying in school. Gail Davis: What a great story. I love that. Susan "Sue" Ershler: [00:18:30] I do too. Gail Davis: That's really ... When people ask you to speak, are they looking more for the tale of your adventure, of climbing the Seven Summits, or are they ... Because you have a unique value proposition here. There are other mountain climbers, but I don't know how many have such a solid business career. Are they looking for the business takeaway, or is it that [00:19:00] combination that draws people to you? Susan "Sue" Ershler: Yeah, I think, Gail, like you're mentioning ... That is usually what the case is, is they want both. Gail Davis: Okay, that makes sense. Susan "Sue" Ershler: Yeah, because I'd love to be just talking about the Seven Summits for hours, but I really do feel great that it's again, that decade that we did the Seven Summits, I was working the entire time. I love that, is what made that work. That's the only two things I did. It was the corporate world and [00:19:30] the Seven Summits, but I just ... I don't know, it was just perfect, because it made me happier, it made me more athletic. I'd go back to work, it was like, "Oh, you're in great shape, and da da da, and you have to focus on things. Can't drink every night." It worked. Gail Davis: I can't believe you were 36 when you started that. We were having dinner the other night and Kyle and his brother were both saying, "Maybe we're going to climb the Seven Summits." I guess anybody can decide, if they're willing to [00:20:00] put the plan together and prepare. Kyle Davis: We also said that you don't have to train that hard to climb Mount Kilimanjaro. Gail Davis: Yeah, you might want to correct him on that. I told him I wanted to take them to Africa on a safari. Susan "Sue" Ershler: Oh, I love that. Gail Davis: They said, "Well, maybe while we're there we'll just climb Kilimanjaro." I said, "Don't you think you have to train for that?" They were like, "Oh, we don't know." You might have some commentary on that one. Susan "Sue" Ershler: On that one, in the very beginning ... I've done it three times, but the very first time, hadn't done ... Other than Rainier. [00:20:30] I know my husband told me all the details, because again, they lead climbers all over on all seven continents, so I had a lot of details and so was like, "Okay." Then the first ... We did a route where you're just going the first six days. Not a problem. Then the last morning, you're going up over 4,000 feet, above 19,000. You go from 15 to 19, right about there, and it's a long morning. That's just the tough part of it. Though when you get down, you're just coming [00:21:00] right down. It worked really well. It's just kind of a long morning. Then what I really liked about this too ... This is true on Rainier, it's true on Everest. You're climbing in the middle of the night. Same with Kili. Susan "Sue" Ershler: Yeah. You're like, "Oh my god." It's hard, it's dark. It's like, "Am I going to turn around? How am I going to put up with this pain?" All these things. Then the sun comes out, and when it comes out, it's like, "Oh." That sets you right back into it. Then you get to stand up there in the sun, and it's [00:21:30] like, "This works." Gail Davis: I know for the Grand Canyon there's a lot of the hiking at night because of the heat, but I'm thinking mountains, cold, so I'm surprised about the nighttime climbing. Susan "Sue" Ershler: You're right, because it's usually colder, but what this mostly does ... Especially again because I'm with guides a lot. The reason they're going to do it is if someone gets hurt, if someone ... If anybody gets hurt, then you've got all day [00:22:00] with the light to be able to help them get down or whatever. If you did it and you're not on the summit until really late in the day, then it can be totally dark, and can you get the person down? Can you help somebody else? Susan "Sue" Ershler: That could be a challenge. Gail Davis: That's good. Back to being prepared. Gail Davis: When people come up to you after they've heard you speak, how have you made them feel? Are they inspired to go smash their sales goals, or are they [00:22:30] wanting to sign up to do mountain climbing? What kind of feedback do you get? Susan "Sue" Ershler: What I really like is ... Because the word that I've heard the very most for these 15 years is "inspired." That's the one word that I've heard the most, and that makes me feel really good. I have a feeling that it's for many reasons. Then they're going after their future journey, whether that ... Usually I think it's both. They're working, they're working out. It's those two things. [00:23:00] I think they also think, "She's five foot two and she can climb Everest? I can do anything." And it's true. It's true. Kyle Davis: That's an easy ... I'm six foot three. I would hope that if you can do it, I can do it too. Susan "Sue" Ershler: Yeah, wow. Kyle Davis: Advantage. The air is thinner up here, so maybe [00:23:30] I'd be ready for the mountain. When you're speaking to an audience, how do you want to leave them feeling? What key takeaways do you want to leave them with to have them be more inspired and to hit their goals and everything else? Susan "Sue" Ershler: Yeah, and you know, it's really both. It's climbing all these mountains, the challenges that you're going to go against, big challenges, but then also sharing [00:24:00] the lessons that we learn in business that really helped in the high mountains. Also, what we learn in the high mountains that really help us in the business world, because so many of them are so similar. When we share a lot of those lessons throughout the journey of climbing the Seven Summits, I think, again, I have people a lot of times tell me, it's like, "I'm going to use that for this." It just depends on what they're [00:24:30] going to be doing and such. I really like that part of it as far as just what we talked about, pulling that plan together, but really having the vision, and then the persevering. To be able to stand on top. The toughest part, pushing through the pain. When you're up there near the summit of Everest, you know, what I know I felt a lot of times was extreme pain in my body. Everything that you've done, you can hardly eat anymore. You lose a lot of weight on the last week or so, because your [00:25:00] body can't acclimatize. It's not really, not too much. We were up there for 63 days. The first time, that helps, because you got to be up there for a while to build red blood cells and can't do this thing overnight. When you're up there for a while, you still have some pain. You're extremely hungry and haven't been able to sleep, but then it's like you just have to push through the pain. That's what I'd tell myself. Next step, push through the pain. [00:25:30] Pain's temporary. Pride's forever. Keep going. Kyle Davis: I remember having ... I remember on my football team in middle school ... I'm not going to drag this kid, but I remember this guy saying that. We all looked at him and go, "Thanks." "Pain's temporary, pride's forever." "Okay, thank you." That's awesome. Susan "Sue" Ershler: That's right. Kyle Davis: Aside from the glaringly obvious parallels of pain and perseverance and setting forth a plan, what [00:26:00] are just a few more parallels that maybe aren't so obvious between mountain climbing and succeeding in the business world? Susan "Sue" Ershler: There's no question that committing to the summit sure helps, and made a total difference, and of course it was the same with business. Every single year wanted myself and my team to win President's Club or the Circle [00:26:30] 100 or whatever it happened to be. Then when we look at that every day, every single day, and look at our team higher than maybe they see themselves, maybe, and treat them that way, give them lots of recognition, lots of feedback, lots of mentorship, just never, ever, ever letting them quit. My husband, again, just ... An international mountain guide for 40 years, and he came up with this saying. He came up with it years ago. "Surround yourself with people who [00:27:00] won't let you quit." I love that one. Kyle Davis: I think that's a good place for us to quit. Gail Davis: Yeah, that's a good takeaway. That's a good one to leave on. That's awesome. Surround yourself by people that won't let you quit. Gail Davis: Thank you, Phil Ershler. That's awesome. Kyle Davis: If you want to have Susan "Sue" Ershler come speak for you ... Wow, that rhymed a little bit, didn't it? Susan "Sue" Ershler: Hey, that works, Kyle. Kyle Davis: You can [00:27:30] contact GDA Speakers at 214-420-1999 or by going to GDASpeakers.com. For the transcript, books, and everything else, you can go to GDAPodcast.com. With that, Sue Ershler, thank you very much. Gail Davis: Thank you very much, Sue. Thanks. Susan "Sue" Ershler: Thank you both so much.